Staying in paradise at Marigot Bay: Brand new 3 bedroom bayview apartment at Marigot Bay, one of the most beautiful bays in the Caribbean. Overlooking the marina the apartment spreads out over two floors and has its very own plunge pool. The apartments at Marigot Bay Resorts at Marigot Bay are exquisite & finished with the ultimate luxurious touch. The apartment has beautiful modern stylish dark wooden furniture, a fully equipped kitchen with state of the art Italian appliances, utility room and spacious dining area. The living room with a flat screen TV, DVD, WIFI & ethernet access offers views over the marina. The resort with its marina, spa, shops, restaurants & swimming pool offers a frequent ferry service to the famous sandspit beach, a near 2 minute from the marina. Come & enjoy heaven on earth! Restaurants and Bars: The Rainforest Hideaway: A fine-dining fusion restaurant & champagne bar. A 2 minute ride across the bay on the resort's own ferry. This is the ultimate romantic retreat with a gentle jazz ambiance, tropical blossoms, vines and fairy lights, situated on its own dock out over the water. Hurricane Hole Bar: Experience the original bar, famous among yachtsmen worldwide, restored to its former glory, with a panoramic view of the bay. The Boudreau Restaurant: Named after Walter Boudreau, the legendary schooner captain who sailed into Marigot Bay & built the first hotel fifty years ago, the elegant restaurant showcases Boudreau memorabilia & historical pictures. Open for breakfast, lunch & dinner. Pink Snail Bar: Chic cocktail bar, themed around the original Dr. Dolittle movie. The Coffee Dock: A European-style coffee shop, serving breakfast, snacks & sandwiches around the hotel dinghy dock. The Bakery: Ice cream parlour & patisserie in the Marina Village Garden. Climbing: St. Lucia is mountainous, with hills and mountains ranging from challenging climbs requiring some mountaineering experience, to vigorous walks, all with wonderful views. Rainforest Hiking and Walking: Access to nearby bays and hillsides as well as deep rainforest trails. Yoga, Tai Chi and exercise classes: as well as meditation and tess management groups. the advantage of this property is that you have plenty of space to spread out over two floors and a dining area and kitchen allows you to prepare the occasional meal in your own condo, should you wish to!! Given that the caribbean is not cheap this can make a difference of many hundreds of pounds to your food and drinks bill! Bathrooms have hairdryer, shaver socket, make-up mirror and telephone, walk-in drench shower. in addition to all the facilites described above, there is a utility room with storage cupboard, iron and ironing board, washer/dryer and stainless steel sink. we had a wonderful holiday in Capella in Marigot Bay, one of the most beautiful places in St. Lucia; Michaela, the owner, has been great in dealing with all our queries and been patient and very friendly and helpful! the property is amazing, laid out over two floors and very spacious; we very much enjoyed having had the option of cooking from time to time in the apartment and having had a spacious living and dining area in addition to three very spacious bedrooms! the staff is extremely friendly and helpful! we got little nibbles and tasters around the pool every day ! The sunsets from the bay are amazing and the whole resort has been newly renovated and decorated to an an extreme high standard about 2 years ago! It is at luxury end of the property market in St. Lucia with a variety of restaurants, various pools and relaxation areas and our 3 boys enjoyed the session in the gym in the morning. There is a little beach opposite which you reach with a 2 minute ferry ride! there is lots to do in St Lucia from climbing the amazing Pitons to Zipwiring, diving, snorkelling, the botanical gardens and Drive in Volcano at Souffriere and exploring the beautiful and very hilly island by car and boat! The price offered by the owner is about 25% from what you would pay if booking directly with the hotel! We really liked the location and the Condo! Staff is excellent, the rooms are very well maintained. Everything worked and the view was amazing. Lots of stairs but if you are in decent shape no issues. Cannot say enough about the staff and the amenities. The pool is amazing and the swim up bar really makes a great end of the day. The trip over to Dolittles is easy by ferry, takes minutes. We dove everyday with Dive Fair Hellen who was also a great operator and dive shop. It is a great slice of life and very beautiful. One small note, the beach does have people trying to sell you stuff, but it does not in any way take away from the great Capella location! We really enjoyed the 3 bedroom villa at the Capella in Marigot Bay! The facilities and service are wonderful at the resort. The owners were great to work with and were so responsive! Thank you! The villa itself is very nice and is well appointed and well stocked. The resort treats you as if you booked through them with daily housekeeping, concierge service and non-alcoholic drinks stocked in the refrigerator. The only downside at this resort is that the beach for the resort is very small (just as described in the owner's information) and the service at the beach is not as good as at the pool and other areas. Locals do try to sell you all kinds of things while on the beach because all of the beaches are public so the resort cannot keep the area private. The pools and service at the pools was wonderful though, and day trips on catamarans and other activities can make up for the lack of much beach. St. Lucia is a beautiful island and Marigot Bay is a lovely place! We had a great trip! many thanks for your feedback. I am glad that you had a wonderful holiday and as you mentioned, the service at Capella and attention to detail is second to none. Yes, Marigot Bay sadly has only a relatively small yet very scenic beach as it is an inlet harbouring all the yachts from hurricanes and winds. There are beaches just round the corner, reached by a small boat ride! thank you very much for having chosen our beautiful condo and we would love to welcome you again at some stage in the future! We reallly enjoyed St Lucia and Marigot Bay . The resort/ villa /ammentities were above and beyond. The staff are always upbeat and happy. Sitting pool side they will bring you complimentary snacks. It was a very relaxing holiday. The actual unit we stayed in was not the unit pictured, we were confused at first thinking there was some mistake. But sadly it was not a mistake, this unit was an ocean front, garden view. It was really important to us to have an ocean view so it was a disappointment for us. If an ocean view is not in your criteria you will absolutely love this villa and resort. Agree with all the reviews. We were completely amazed. The photos don't do this accommodation justice. The living area is spectacular. The scenery is outstanding. The service at Capella is first class. They arranged everything for us. They planned out excursions and dinner reservations. Outstanding is all I can say. Even though we stayed in the low season of tourism, we did not hear another sound from any of the other guests. Everything is solid. The doors, the walls, the stairways. Couldn't hear a thing. The AC and fans work very well for those hot and humid days. We stayed with two very boy teenagers that were able to relax and have fun. It was a great anniversary trip to spend with the family. Thank you Michaela! You have an amazing place. Highly recommend. Everything about this holiday was first class. Firstly the accommodation was excellent: it was spotlessly clean, spacious and had everything we needed for a comfortable stay, including brilliant air con which was essential. The staff within the hotel were so friendly, polite and very helpful, with nothing being too much. The location was just perfect, with fantastic views of the harbour.The beach wasn't the best on the island, but a visit to Anse Castanet certainly was worth it, especially for the snorkelling. The restaurants, within the bay were exceptional, especially the Rainforest Hideaway and Julietta's, where the sunset was breathtaking. My husband and I went with our 2 children (aged18 and 16). There was something for all of us, cricket, exploring the island, lazing by the pool, snorkelling, boat trips,lovely restaurants... It was a unanimous decision, it was one of the best holidays we've been on and would certainly go back. The resort on the west coast of the island is located about 5 miles south of the capital Castries (20 minute drive). It has convenient access to Hewanorra International Airport (about one hour) in the south and George FL Charles regional airport at Vigie (Castires). 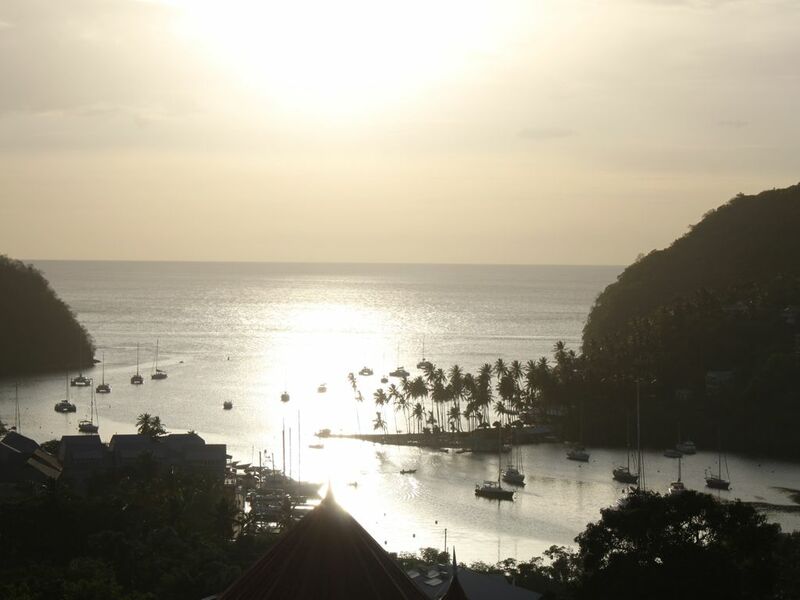 Marigot Bay itself is one of the region's safest, most beautiful and best-known yacht harbours. Trips around the lush tropical island and its various highlights like the Pitons are at easy reach from the resort. Prices are per property per week and are inclusive of St. Lucian taxes. A 25% deposit is required upon booking with the rest payable 8 weeks prior to departure.